USS Nimitz is the first ship in the NIMITZ class of aircraft carriers. The Nimitz Class aircraft carriers are the largest warships ever built. With over 6,000 personnel (crew and aircrew), the carrier has a displacement of 102,000 tons, and a flight deck length of 332.9 meters. All seven nuclear-powered Nimitz class carriers have been built by Newport News Shipbuilding (now Northrop Grumman Ship Systems), based in Virginia. 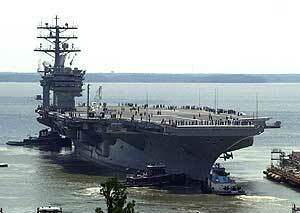 The tenth and last Nimitz Class, CVN 77, will be built by Northrop Grumman Ship Systems and will enter service in 2008. This will be the first transition ship to a new class of carriers (formerly named CVNX) and will incorporate new technologies including a new multi-function radar system, volume search radar and open architecture information network, and a significantly reduced crew requirement.